Rambling Moose: Ponderosa Lemons Anyone? 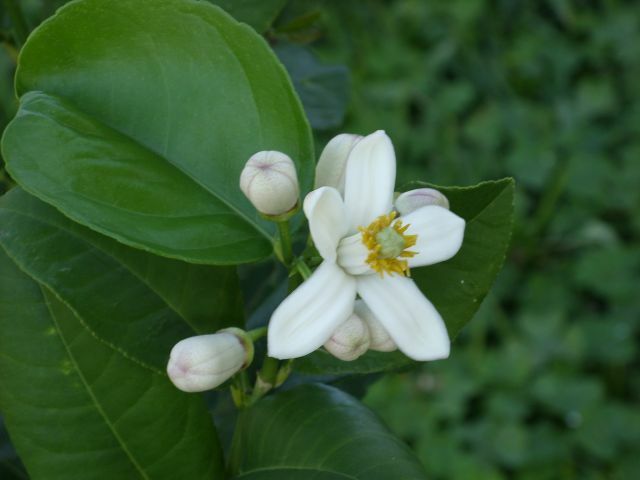 In the middle of winter, a Lemon Blossom Opens. For us it is cold, we are all huddling inside our leaky houses with windows that don't quite close. Some have no heat, others have a heater for the entire house that a person in Minneapolis would have under their desk in an office. Outside, flowers are still in bloom. The breezes that are coming in from the North grasp the palm fronds, move the pollen in the Mango flowers on the trees, scatter the papery Bouganvillea blossoms. Walking out to the corner, you can catch the scent of millions of Mangoes of the Future on the air. There are also the scent of jasmine and citrus to join it. After having excellent luck with the Meyer Lemon tree in the yard, we decided to try a different lemon tree. The problem with the Meyer was that while it was prolific, it also had not survived the last two cold snaps as well as we would have liked. Instead of moving the pot to where it was more sheltered, we found a Ponderosa Lemon and put it in another pot. It's now in an even more exposed space, but it seems to like it. Silly tree. What we didn't realize was that while it was difficult to use up all of the Meyer Lemons, the Ponderosa will give a different problem. The tree produces fruit at least the size of an orange, and I have heard that it can grow to the size of a grapefruit. Even the blossoms are larger. The bud in that picture is the size of your thumb nail. I was given a large bag of Meyers by a good friend here in town and enjoyed them thoroughly, even saving off some seeds. Then the tree I have had to be picked. We ended up with enough to start drinking Meyer Lemon and Limeade, and tried making another Meyer Lemon Cheese Pie that I never quite got the proportions right on. With four more Meyer Lemon trees started, plus the Ponderosa, I think I'm going to have to make quite a lot of Lemon dishes next season. Anyone for a Lemon Cheese Pie? Why Do Birds Fall Down From The Sky? Happy New Year in "Times Square"